Savvy marketers know that it costs a business more money to acquire new customers than to sell to existing customers. In fact, a repeat customer on average spends 67% more than a new customer – that’s a significant gap. With this in mind, many businesses offer loyalty programs to their dedicated customers in the form of discounts, free products or VIP treatment. The most common form of loyalty program, a point system encourages customers to collect points they can eventually exchange for a product or special service. Unfortunately, many loyalty programs that implement this strategy fail to make a profit. Why? Their rules are too complicated and their conversions too challenging, ultimately giving math tests not rewards. Target’s redperks program does a great job of keeping the formula simple: $1 = 10 points, and 5,000 points = a reward. If you choose to go with a points system, make sure the conversions are simple, and keep in mind that this type of program works best for businesses whose customers make frequent short-term purchases. If you’re looking to incrementally increase the desirability of the rewards, however, a different type of program may work better. Tiered programs are similar to points programs, but the former encourage customers to make increasingly larger purchases in exchange for increasingly more desirable rewards. This type of system works by providing minor rewards when a customer first buys a product and then increasing the value of the rewards as he or she continues to make purchases. Although it may seem like having to pay for benefits would turn away customers, certain VIP programs provide a compromise for frequent shoppers and retailers. Both Costco and Amazon Prime are, well, prime examples of this philosophy. While certainly not appropriate for the occasional shopper, these memberships provide great value that offsets the upfront cost to enter. Given its membership fee, Costco is able to consistently provide the lowest prices for bulk merchandise, and Amazon Prime offers free two-day shipping on millions of items – a hard-to-resist temptation for shoppers who make regular purchases and who would otherwise spend hundreds of dollars alone on having their items mailed. This and the previous two strategies mentioned above are traditional forms of loyalty programs, but there is another type if you’re not quite ready to commit or are looking for a more creative way to reward your most dedicated customers. If you’re not sure which of the above programs you’d like to go with, you can offer a mixed bag of sorts. 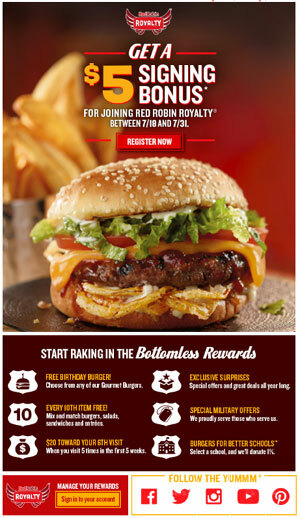 Red Robin, for example, offers a variety of goodies with its Red Robin Royalty rewards program, which anyone can sign up for easily on its site. (The name has a nice ring to it, too.) Among the benefits are free burgers on birthdays, a complimentary item with every 10th purchase and credit toward your next order if you eat at the restaurant often. Although Red Robin’s particular approach to rewards might not work for your business, the nice thing about a mixed offering is that you’re not tied down to any one method of rewarding customers. All in all, loyalty programs are great ways to reward people for supporting your business consistently. Just remember that loyalty programs are meant to benefit both you and your customers. No matter which system you decide to go with, make sure to keep your strategy simple – it will not only make your job easier but also ensure that your customers remain satisfied.